The pavilion at Gather Greene. While the Hudson Valley has long been the playground for wealthy New Yorkers, it is now also the hallowed ground where city couples and out-of-towners are saying "I do." With options ranging from epic old dairy barns to 19th-century industrial warehouses, there is no shortage of ideal venues for every vision and style. But as couples hunt for that perfect place to make all their Pinterest dreams come true, guest lodging can sometimes fall by the wayside. Given that family and friends are probably travelling from all over to join you for your big day, choosing a venue that has ample accommodations onsite or nearby is a thoughtful consideration. Plus, the more the merrier! We've rounded up 15 wedding venues in the Hudson Valley and the Catskills that have onsite accommodations. The smallest can sleep just the bridal party and close family and the largest the whole wedding of over 100 guests. Gather Greene, a new event site and glamping destination in Coxsackie, blends accessibility, comfort, and access to nature. With 100 acres of woods just 20 minutes from Hudson and 17 Scandinavian-style tiny house cottages for two, the grounds offer a private and relaxing environment for your big day. The permanent, open-air pavilion has capacity for 250 guests, with 28-foot-tall, arched ceilings and sweeping vistas. It also has a full catering kitchen, six single-use bathrooms, two dressing rooms/meeting suites, and a large upstairs lounge. 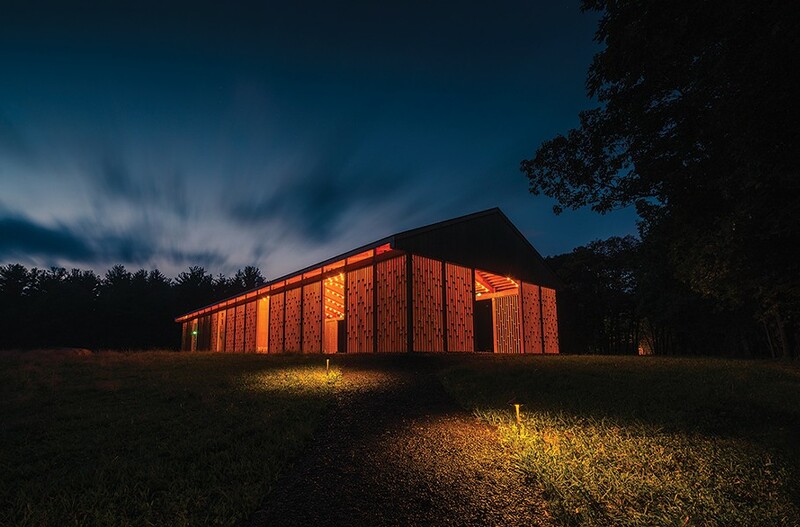 From industry to avant-garde arts hub to wedding venue, Lumberyard in Catskill is truly a synecdoche for the changing economy and cultural climate of Greene County. 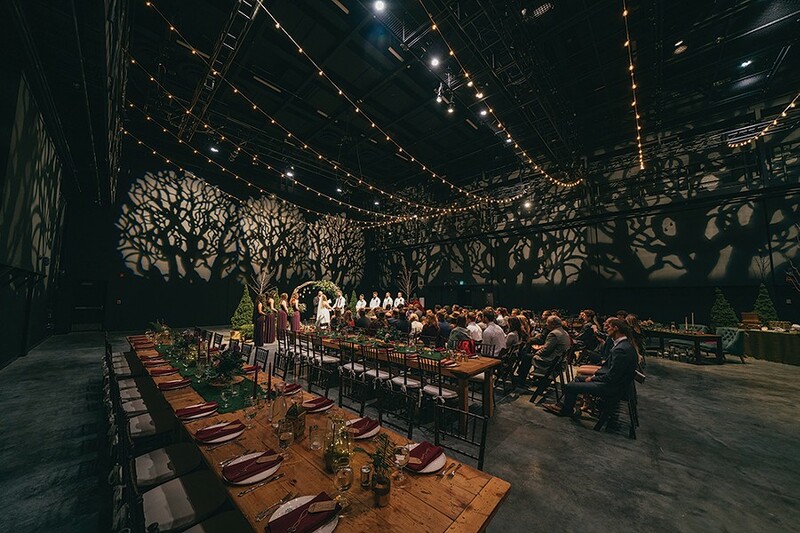 Couple can choose from either the industrial-chic Theater/Ballroom, which can accommodate up to 390 guests, or the smaller, rustic Creekside studio, which can hold 150 guests, or do a full-property buyout for exclusive use. With 13 recently renovated guest rooms, the venue can sleep up to 25 guests onsite. The theater/ballroom at Lumberyard in Catskill. Once the site of a hydro-powered mill, this luxury boutique hotel in Saugerties overlooks the gushing Esopus Creek. Diamond Mills has a flexible space that can comfortably accommodate your events. Up to 350 guests can attend a wedding here, with a ceremony overlooking the falls and a reception in the well-appointed ballroom. With 30 rooms, this inn can sleep a hefty chunk of your guest list. If you'd prefer, you can have your wedding at Diamond Mills' sister property Saugerties Steamboat Co. A full-service event venue and boatyard set on a historical site, Saugerties Steamboat Co. offers spectacular views of the Hudson River with both outdoor and indoor sites for your reception and ceremony. After taking over Audrey's Farmhouse in 2015, Sally and Doug Posey bought the lot across the street, a former flower nursery, which they have transformed into The Greenhouses—a 14-room hotel, jungle-chic wedding venue, and restaurant. With accommodations in the hotel, the farmhouse, and the adjacent cottage, the property can sleep 42 people. And Audrey's is pet-friendly, in case you want your Rottweiler to be your ringbearer. 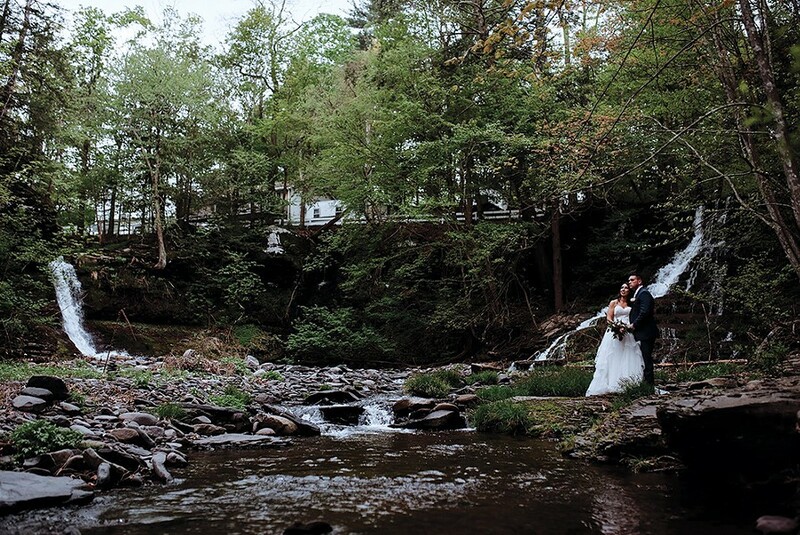 Situated right in the middle of the Catskill Forest Preserve, Full Moon Resort offers a tranquil, natural setting for your wedding with over 100 acres of mountainside forests, meadows, streams, and ponds. Get married creekside beneath the sky, in a field under a tent, or in the rustic wedding barn. A year-round setting for educational, recreational, and artistic workshops, Full Moon offers a handful of venues for every phase of your wedding from welcome cocktails to the late night bonfire hang. There is also a wide range of accommodations from glamping to country-inn-style guest rooms to luxury cottages. Waterfalls at the Glens Falls House in Round Top. Perched on 50 acres, the Glen Falls House offers miles of wooded hiking trails, open fields, swimming holes, and two waterfalls. The property has lodging for 110 guests split over three buildings plus camping. Given the bucolic grounds and the abundance of lodging, this resort is a prime wedding destination for larger parties of 150 to 300 people. With two onsite catering and group event packages, this is the perfect spot for a summer camp-style wedding. Sitting on the banks of the Hudson River, Buttermilk Falls Inn & Spa is an idyllic venue encompassing 75 acres of cascading lawns, woodlands, and winding streams. A hotel and working farm with a spa and restaurant, this venue combines historic elegance, modern luxury, country charm, and sophisticated amenities (plus peacocks and donkeys!). With 18 suites, the inn accommodates up to 50 guests. The onsite restaurant, Henry's at the Farm, will handle wedding catering and the world-class eco-friendly spa is perfect for relaxing before the big day. Want to have an upstate wedding but with an urban flair? The Poughkeepsie Grand hotel recently unveiled its rooftop ceremony garden, which offers panoramic views of the Catskills, the Hudson River, the surrounding cityscape, and the farms beyond. There are also two ballrooms to choose from if you'd rather say "I do" indoors. With over 200 rooms, there is definitely space for the whole guest list. Wedding blocks start with a 10-room guarantee, and all bookings include a wedding suite for the couple. Just a few blocks from the Metro North Station, out of towners can get to your wedding without renting a car. Huzzah!